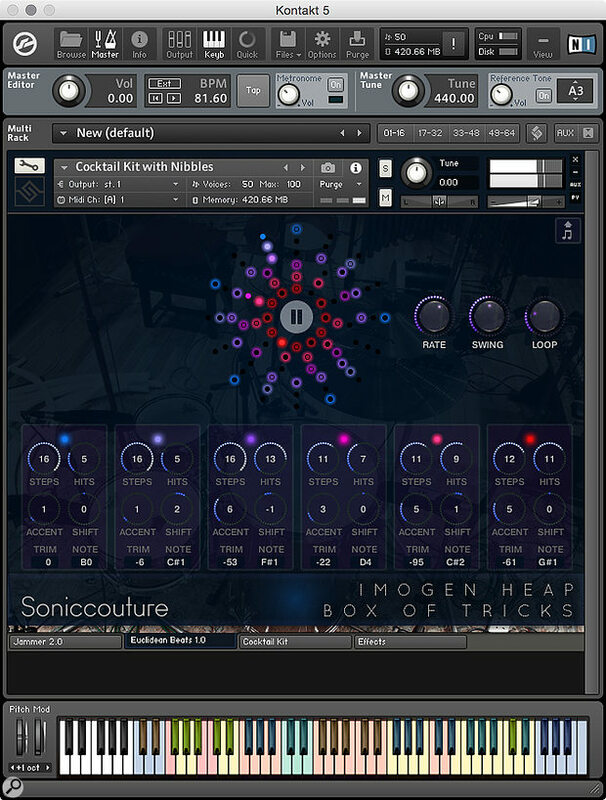 Soniccouture have made a name for themselves as purveyors of boutique sample packs, often focusing on quirky and sonically fascinating sources, so an Imogen Heap Kontakt library feels like a perfect fit for them. However, while Soniccouture sample packs often focus on a single, rare instrument, this is a much broader offering with 13 instruments/kits drawn from Heap’s eclectic personal collection. So, where to start? Well the Array Mbira is probably as good a place as any, as it’s one of the instruments Imogen is most associated with, as well being the first in the list. This is one of the more straightforward sampled instruments in the collection, and does a good job of showcasing the production quality and the performance tools. The sound is great, with long, clean decays. The response across the nine sampled velocities is consistent across the large range of this instrument: no mean feat when trying to faithfully capture the sound of a few dozen metal prongs screwed to a box! The Mbira shares a variation on the custom control panel that Soniccouture have created for nine of the instruments. All the instruments that use this panel have knob clusters for envelope and filter settings, a Reverse button, Autopan, and a ‘Slim’ control. This last is designed to thin out the sound by attenuating the fundamental frequency of the instrument. A peak under the hood shows this to be simply an EQ band with a frequency set for the instrument. Each instrument typically also has a couple of unique controls, plus switches for different articulations. Articulations are also available as MIDI keyboard switches, highlighted in red on the Kontakt mini keyboard. In the case of the Mbira, you get a Strum knob (which will be the name of my next band). This super-effective script lets you create downward or upward strums of different speeds. The Mbira is also the first place to encounter the Jammer script that many of the instruments share. This panel provides powerful arpeggiation and auto-sequencing, with the ability to store up to 12 snapshots in a coloured wheel. The notes generated by Jammer can be set to a range of scales, and you can further constrain the note possibilities manually. A particularly special feature is the Evolve, which lets you set a speed, range, and amount by which the generated note sequence will vary over time. Finally there’s a built-in recorder to let you capture these performances as MIDI. This worked great in my tests: I was able to capture chunks of what Jammer was doing, then drag the resulting MIDI clip from the Kontakt panel to a slot in Ableton Live. If that’s not enough, the Harmoniser panel gives you a custom-worked version of an NI script for generating chords. In the Effects panel, Soniccouture have set up a custom multi-effects chain where you can choose and control up to six effects at a time from a pool of 12. 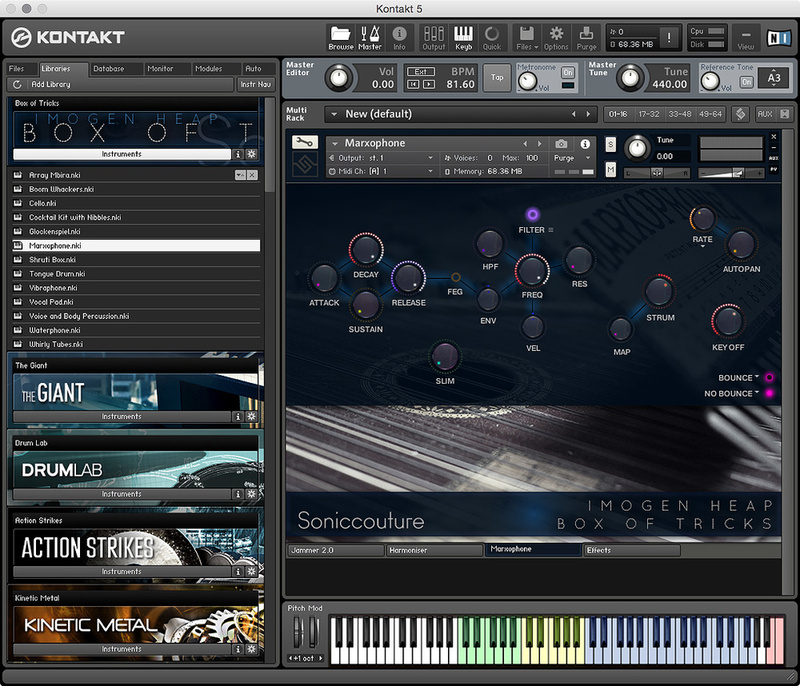 The most interesting section of the effects, however, is the convolution reverb, which features a number of responses taken around Imogen’s unique house and home studio. These locations provided both the sonic fingerprint and inspiration for the brilliant 2009 album Ellipse (see the December 2009 issue of SOS). One of Box Of Tricks’ custom scripts in action. Suffice to say, a lot of time and knowledge has gone into creating this platform; now let’s dive in and look at some more of the instruments, which is where Imogen’s unique musical personality comes to the fore. Boom Whackers is that most glorious of instruments: a bunch of tubes that you strike the end of with what I always imagine to be table tennis bats, but in this case is a choice of wooden or carpet beaters. It’s great fun, and makes particularly inspired use of NI’s excellent Transient Master effect to add a large range of usable sounds. Next up is a cello: nothing revolutionary you might think, and indeed there’s no major surprises with the default Pizz articulation, although it has a very nice warm, rounded character. Switch to the bowed articulation, though, and you get a uniquely delicate, scrapey drone with lots of harmonics, and a nice sharp attack that can be played with fast notes as well. This is taken to a spooky extreme in the Slide articulation. Next we come to one of the two kits, whimsically named Cocktail Kit With Nibbles. This is Imogen’s unique drum and percussion kit, which she admitted in these pages to miking in a rather cavalier fashion at home, but which has been captured to perfection here in a lovely sounding room. However, it’s not so much the sonic quality that makes this one of the highlights of the whole package, it’s the breadth of performance. There are loads of different variations, rolls and articulations that make this great fun to play on pads, and it’s easy to come up with a natural and varied drum track. The kit patches feature an additional page, Euclidean Beats: a unique six-track sequencer for quickly generating drum patterns. For each of the six sources you pick the sound, the length of the pattern, accent amount and the number of hits to play. The hits are then intelligently spread into a pattern, which you can offset against the other loops. This is great for generating ideas, over which you can continue to play live. The other kit (Voice And Body Kit) is completely different, comprising a large set of percussive sounds and vocalisations performed by Imogen. One is hesitant to overuse the words, ‘unique’ and ‘fun’ in one review, but it can’t be helped. The other instrument in the collection that is entirely Heap-centric is the Vocal Pad: a fairly simple sample set of Imogen singing ‘hah’s. This is made more interesting with faders for blending effected and reversed versions. 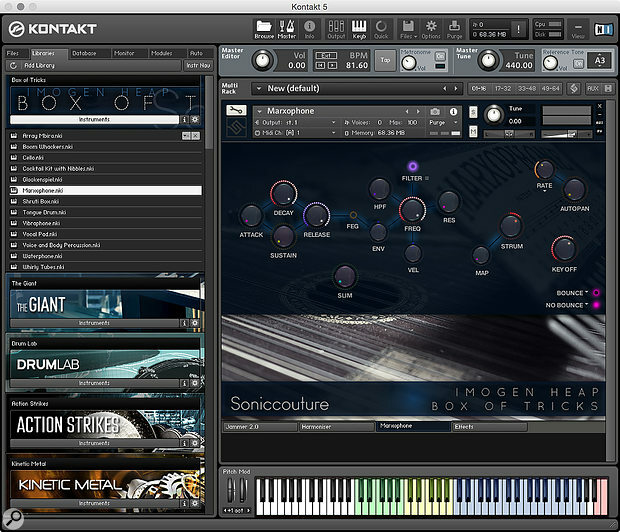 As with the other instruments, the factory Snapshot patches show the variety of results you can achieve from this starting point, using the additional controls, effects, and the Jammer and Harmoniser. The Waterphone is a huge set of different sounds generated by Imogen from this strange cinematic instrument. Like the drum and percussion kits, this instrument features a Focus button on the GUI that switches the mode so that the most recently played key is spread over the keyboard and can be played at different pitches. As with the drums, I wished that this map was rooted on the original key that played the sample instead of C3. The other quirky instrument is the Whirly Tubes — you know, the big plastic tube you swing around your head that excites different harmonics at different speeds. This has been cleverly simulated with a knob to control the overtones, which appear to be generated by triggering multiple octaves of the fundamental sample. These samples employ long loops, so hats off to Imogen for what was probably a tough day at the office spinning those tubes at an impressively even pace for long recording passes! Other instruments in this rich set include a vibraphone, shruti box, glockenspiel and tongue drum. A special mention should also go to the Marxophone, that wonderful zither-like instrument. This offers various articulations, including individual strikes with or without bounce, minor and major chords, and the brilliant strum control we first encountered in the Mbira. These sets are offered in several different key mappings and splits. An awful lot of care and work has gone into Box Of Tricks and the result is a captivating and, above all, playable set of instruments. The custom scripts are not there to show off, they are genuinely useful performance enhancers. The danger with this project could have been to veer too much toward quirkiness and whimsy, or create a set of instruments that recreate Imogen Heap songs. Luckily, this has been avoided, while still letting Imogen’s playfulness and sonic sensibility shine through. And far from being a Heap sound-alike construction set, Box Of Tricks has wide cross-genre appeal, as well as being ripe for film and TV production, and is as beguiling as the artist herself. Generous collection of captivating instruments. Super-playable drum and percussion kits. Ingenious performance tools built into the GUI. Box Of Tricks offers a wonderfully warm and dynamic palette of acoustic sounds guaranteed to enliven and humanise any music or sound design project.